Description: Hamptons Yarn Long Island Fleece and Fiber Fair 2016 at Hallockville Museum Farm in Riverhead, Suffolk County, Long Island, New York. 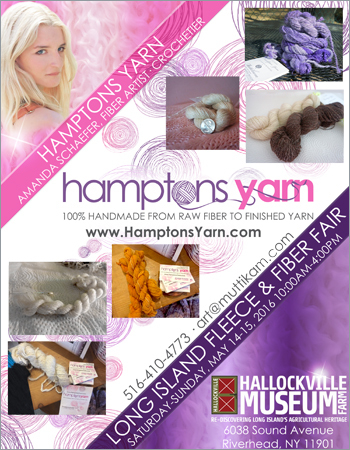 Hamptons Yarn offers handspun yarn, handmade yarn and spinning by crochetier, fiber artist Amanda Schaefer in the Hamptons, Long Island, New York. Hamptons Yarn is a newly founded brand which offers all-natural, handspun yarns which I process by hand from the raw fiber to the finished yarn. This means you know exactly where your yarn is coming from, and I never add any chemicals or use processed heat when working. All fiber is sourced from small American farmers who treat their animals like pets. Many times I am also able to tell you the name of the animal(s) which provided the fiber in the yarn. The Long Island Fleece and Fiber Fair is the first of its kind in the region to bring together the diversity of fiber arts activities! Visitors will see and learn how local artisans craft wool and other animal fiber into beautiful finished pieces of clothing and art. The fair provides two fun-filled days of demonstrations and hands-on learning that can be enjoyed by the whole family. Visit both days for a variety of demonstrations, workshops and local artisans selling their handmade supplies and products in the Naugles Barn Fiber Market! There is something for everyone. 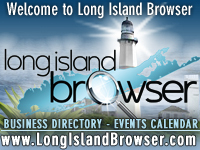 The setting for the Fair is like nowhere else on Long Island- the various activities and demonstrations take place throughout the picturesque Hallockville Museum Farm campus and in the historic buildings that date back to 1765.Food vendors sell a variety of freshly-prepared lunch items for guests to enjoy while relaxing in the picnic area shaded by apple trees.